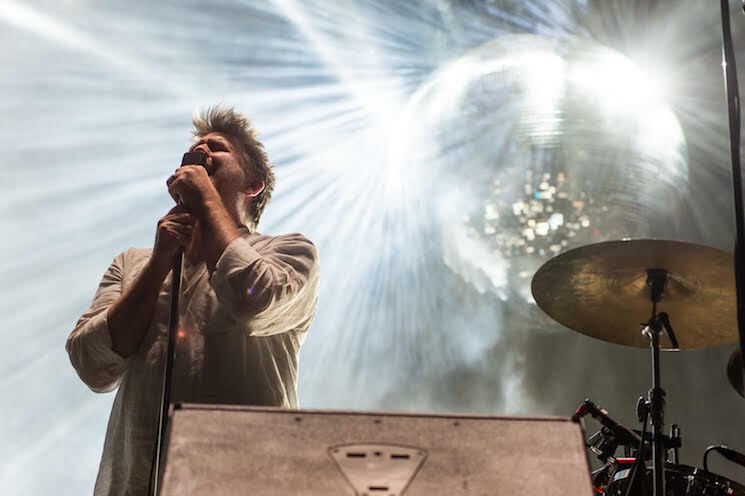 Without traditional "hits" to their name, many questioned LCD Soundsystem's ability to headline a major music festival like WayHome. But those naysayers forget that the cultural aesthetic the fest has tried to cultivate in the past two years was both shaped and wryly chronicled by the Brooklyn crew. Taking the stage to the pulsing groove of "Us vs. Them" mastermind James Murphy stood at the epicentre of what looked like controlled chaos. Gear flanked him on every side, with one of his cohorts masterfully manipulating modular synths, laying down feedback or simply laying down the foundational pulse of the band's songs on the drums, the band rarely let the beat drop. They were all facing Murphy, giving their performance a studio-like vibe, with Murphy sauntering around playing random pieces of percussion or tweaking the sound. The feeling was further heightened by the group's demeanour — despite frequent smiles to one another, Murphy said little to the crowd, and the crowd's presence seemed almost incidental. While their motivations behind the reunion remain foggy – they want the money! They just want to make art together! — the group seem content to let their music speak for them. The set was light on This Is Happening tracks, but otherwise hit every mark an LCD fan would want. "Daft Punk is Playing at My House" was given a funky makeover, "You Wanted a Hit" nicely segued into "Tribulations," and "Losing My Edge" remains a towering totem of keen cultural observation. But the set's real highlight was the collective celebration of LCD Soundsystem fans once again experiencing this band's music together. For all their studio know-how, this band made music for the masses, never more clear than on the night's final two tracks. The massive drum fill the kicks "Dance Yrself Clean" into high gear felt like a call to arms while the repeated calls of "Where are my friends tonight?" perfectly capped an evening that proved naysayers wrong.